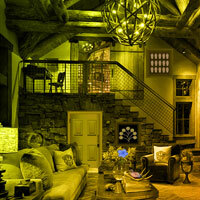 Games2Rule - Countryside House Escape is another point and click room escape game developed by Games 2 Rule. In this game, you came to stay in country side house for your vocation. But unfortunately the door is locked you from outside of the house. No one is there to help you. You have to escape from this house by finding useful objects, hints and solving puzzle. Click on the objects to interact with them and solve simple puzzles. Good luck and have fun! Not many hints, let's see if it's really that easy. Use hammer or dome thingy in front of fireplace. So far, the hardest thing is telling apart the vase colors in my notes. Brush for smear to left of fireplace. Fan hint above fireplace in room where you place the map. Use hammer on faint outline. Lighting 4 candles gets you kitchen key. You can zoom in and out of the book while you're doing the spirals puzzle. It doesn't reset. The blue flowers go in the zoomed in vase. Ok, so this is shorter. Only two sets of rooms. If I'd had a second cup of coffee this morning, it would have been easier.